On the way to Industry 4.0: at the upcoming Texprocess trade fair, a ‘Digital Textile Micro Factory’ will present a live demonstration of an integrated production chain for apparel. In collaboration with the German Institutes for Textile and Fibre Research in Denkendorf and a number of well-known companies in the textile sector, Texprocess will, in the micro-factory in Hall 6.0, demonstrate the entire networked production of items of clothing – from the design stage to digital printing, automatic cutting out and fabrication. 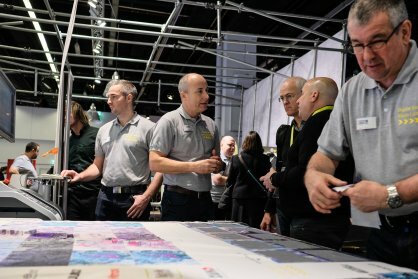 Visitors at Texprocess will follow a signposted path through the various individual stages of manufacture in the micro factory and will be able to get information from experts at each stage. In addition, there will also be guided tours on offer. The first stage in the micro factory is the CAD/Design area. With the help of computer-aided design (CAD) and the Vidya 3D-simulation software, creative designs are put into effect in a virtual reality and/or adapted. The data that emerge from this are immediately merged with data for subsequent processes such as the digital printing of the textile, the cutting out and sewing. The partner for the Design area is Assyst, a company in the Human Solutions Group. The next stage (Printing) demonstrates large-format inkjet printing, involving sublimation printing on polyester and pigment printing on cotton and mixed fibres. Manufacturing tasks can be flexibly combined here with various printing parameters so as to produce a print with reproducible colours. The partners in the software and hardware business Ergosoft and Mimaki as well as Coldenhove and Monti Antonio are the ones ensuring optimum printing results at this station. After this comes the Cutting area. At this juncture in the production process, the individual orders need first to be identified without anyone touching them. Identification is made possible by automatically loading the appropriate data files for the cutting-out process. A feeder system at the cutter ensures that the material is transported as smoothly as possible and without distortion. Camera systems recognise the cutting points, as a result of which the path the cutter is to take is optimised and a top-quality cut can be achieved. The partner in this area is Zünd. In the next section of the production process (Assembling), the cut-out elements of the various orders are also identified in a context-specific manner and added to the garment. This area shows the process of identifying the individual orders and the sewing process, carried out on the latest sewing machines, which can also be linked to the internet. The partner in this area is Dürkopp Adler. Additional partners of the Digital Textile Microfactory at Texprocess are Eschler Textil and Schoeller Textil.